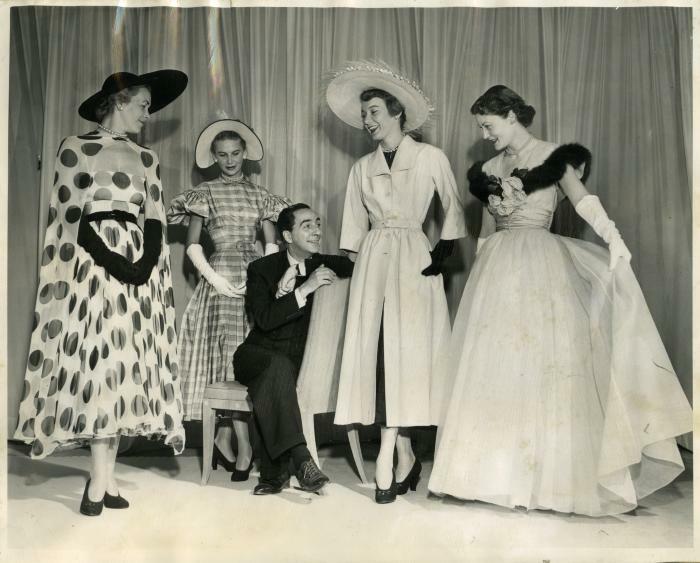 Norman Norell with models wearing Traina-Norell designs from his spring/summer 1949 collection. Image courtesy of New School Archives and Special Collections Digital Archives. During his 50 year career, Norman Norell crafted beautiful costumes, worked under war-time limitations, resisted pressure to substitute quality for quantity, and worked to bring the NYC fashion houses on Seventh Avenue on par with those of Paris. During his time in the industry, Norell managed to escape the pomp and circumstance of New York City and is remembered for leading a simple, “moral” life in the often cutthroat world of high-class fashion design. Norman Norell was born Norman David Levinson on April 20, 1900 in Noblesville, Indiana. His father, Harry, owned and operated a men’s clothing store in the town and this is undoubtedly where he developed an eye for fashion. Harry soon opened a men’s hat store in Indianapolis, and in 1905 moved the family to the city once the business experienced success. Norman completed high school in Indianapolis then moved to New York to begin his fashion education at Parsons Institute. At 19, he began studying at the Pratt Institute, where he studied drawing and fashion illustration. It was here that he combined the first syllable of his first name with the “l” sound of the beginning of his last name and adopted the name Norell. His early years in the fashion industry were spent designing costumes. He designed for a variety of projects, including silent film, burlesque, vaudeville, and nightclub acts. Norell costumed Rudolph Valentino in The Sainted Devil and Gloria Swanson in Zaza, but soon shifted his focus to women’s apparel. In 1928 he began a 12 year stint working for Hattie Carnegie. While a “fierce perfectionist . . . brilliant in her own way,” her process was considered fairly unoriginal – she bought pieces from Parisian couturiers, pulled them apart in New York, and turned them into more affordable clothes for her American clientele. Original or not, working with Carnegie gave Norell invaluable experience by visiting the Paris fashion houses and allowed him to fully understand the construction of women’s clothing. After a falling out with Carnegie over his designs for the Broadway production Lady in the Dark, Norell left and joined forces with Anthony Triana to form Triana-Norell in 1941. Although he was a salaried employee of Triana, Norell was the designer of the company and as such was making waves in the fashion world. Bonwit Teller said of the new fashion house in the October 1941 edition of VOGUE, “The House of Traina-Norell comes on the season like an electrical storm. Its designer, young Mr. Norell, creates a collection so alive that everyone’s talking.” Just two months after that article ran, the United States’ entry into World War II changed nearly every industry in America, including fashion. 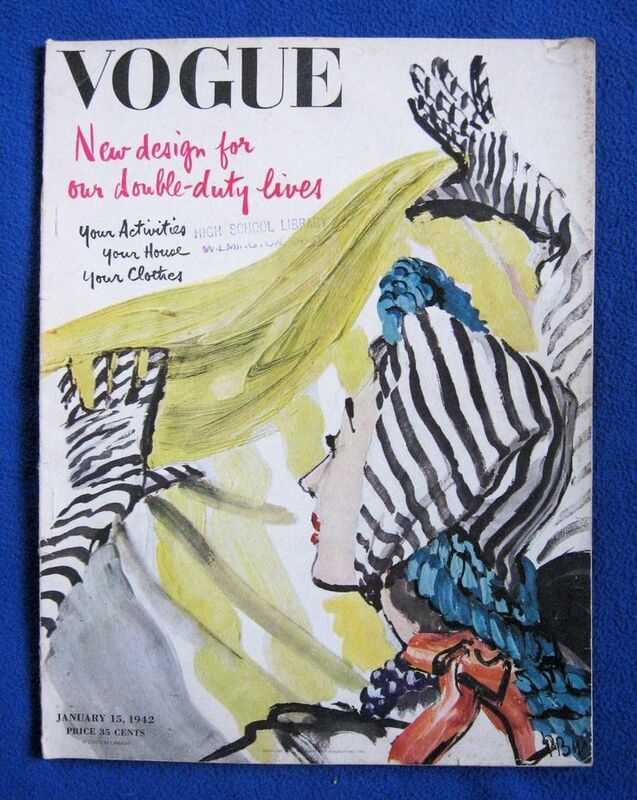 Cover of January 1942 edition of VOGUE. This, their first issue after US entry into WWII, addressed the changes fashion experienced due to the war. Image: Mason, Meghann, “The impact of World War II on women’s fashion in the United States and Britain” master’s thesis, University of Nevada, Las Vegas, 2011. Up until this point in the 20th century, women’s clothing styles changed at a faster pace than ever before. Silhouettes changed entirely about every 10 years, much more quickly than in previous eras. War time restrictions stopped this fast progress in its tracks. On March 8, 1942 the War Production Board issued limitation order number 85, or L-85, which set rules for the production of women’s clothing. Manufactures were banned from making blouses with hoods, blouses with more than one pocket, coats with epaulets, coats with sleeve circumference larger than 16 ½ inches, and reversible skirts. All of these measures reduced the use of material used for clothing production. Hems, which for the previous years had been widening from the sleek, narrow skirts of the 1920s, were reduced from 81 inches to 78 inches. These restrictions challenged American fashion designers, one which Norman Norell met. Norman Norell design “Subway” from the 1942 Traina-Norell collection. This piece is an example of Norell’s war time work, with the simple neck and sleek, waist-less design he helped popularize. Image courtesy of Metropolitan Museum of Art. Drawing inspiration from his favorite era of fashion, the 1920s, Norell introduced the chemise dress, or shirt dress in 1942. This design featured a simple round neckline, a departure from the “fussy” necklines of the time. The simplicity of this trend worked well within the restrictions imposed by L-85 and chemise dresses, along with a fur-trimmed trench coat, became the staple of the Traina-Norell label. Norell never compromised on quality; oftentimes, a single suit jacket would take a week to stitch. This quality came with a price tag, though. 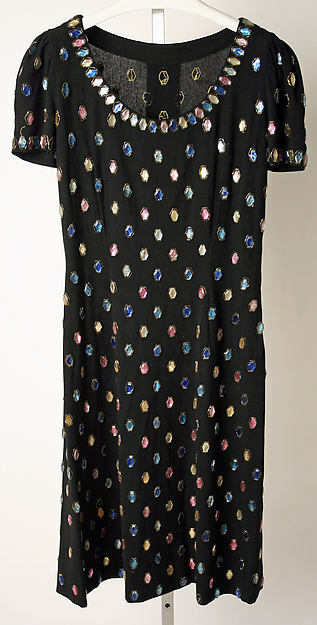 One article said, “Women purchasing a Traina-Norell garment were buying, at great cost, an American-made status symbol that would likely remain in their closets for decades.” The prices for a Traina-Norell piece ranged from $500 for a simple jersey dress to upwards of $4,000 for an evening gown. The Traina-Norell brand continued to set trends throughout it’s nearly twenty year existence. Oftentimes, competitors would copy his designs and sell them for much less. This was so common that the year before he introduced his revolutionary wool culottes suit, he offered the pattern to any manufacturer who wanted it in order to prevent the manufacture of inferior versions of the design. One of his signature evening looks, the “mermaid dress” would not look out-of-place at a gala today. Other signature designs of Norell included the 1961 wide-flaring skirt, impeccably designed coats, the evening jumpsuit, and sweater topped dresses. In 1960, Anthony Traina retired and Norell began his solo carter with the Norell fashion house. Although the name of the brand had changed, the reputation for high quality, long-lasting clothing stayed the same. During his career, Norell won the Coty award three times and was inducted into the Coty Hall of Fame. When the Coty Awards were discontinued in 1985, Coty’s parent company said it was because they had achieved their goal of bringing American fashion houses to the same level of those in Paris, and there’s little doubt that Norell played a big role in that. Former First Lady, Michelle Obama, wearing a Norman Norell dress in 2010. Norman Norell became known as the dean of American Fashion and was active in the industry up until his death on October 25, 1972, just before a retrospective exhibit of his work was to open at The Metropolitan Museum of Art in New York City was to open. Even today, Norell pieces are highly sought after and sell for high prices in vintage clothing shops. 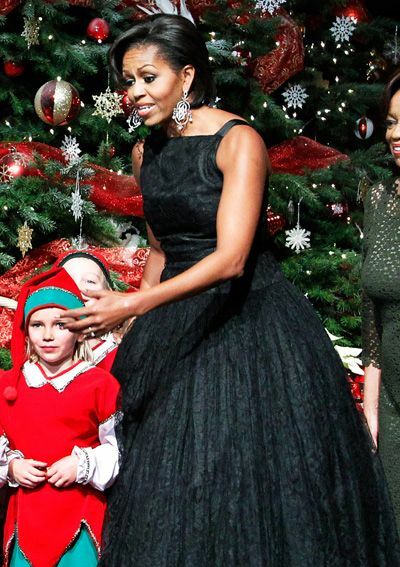 In December 2010, former First Lady Michelle Obama wore a vintage Norell dress at a White House Christmas party, one of the few times a first lady has worn a vintage piece at an official White House event. View over 200 Traina-Norell and Norell pieces on the Metropolitan Museum of Art’s website.